“Oh miam, je veux manger la croûte !” (Oh yum, I want to eat the crust!) Lulu exclaimed as she reached for one golden piece of crust from the tart I had left to cool on the kitchen countertop. It was already too late. Her mouth was full and she was smiling, reaching for more. 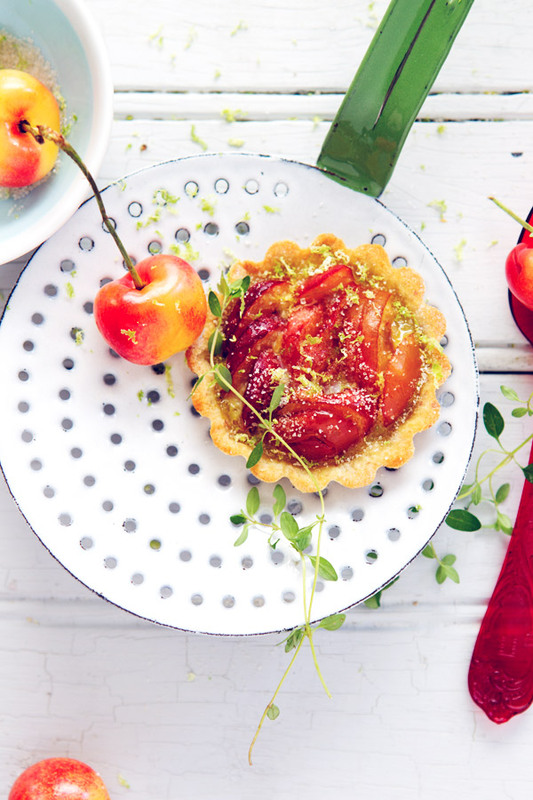 By looking at the cherry tart with its missing crust around the edge (not the one you see here in the picture), you’d have thought that tiny mice had come in the house for a snack. I am no blaming Lulu. At her age, I, too, was very fond of la croûte of the many tarts my mother baked, sweet and savory alike–and it has not changed. In French, we even refer to this part of the tart as le trottoir (literally meaning the sidewalk). And you either like le trottoir, or you don’t. My family and I belong to the first group. 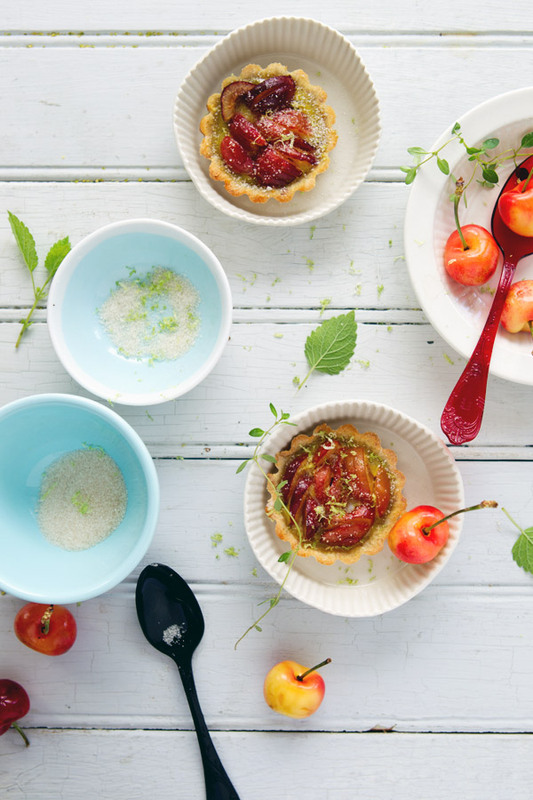 We loved my cherry tart so much that I thankfully baked it a number of times with Rainier cherries which, right after I tasted one, I fell in love with. Every year, I am eagerly waiting for cherry season. I check the market regularly; I ask my parents how their cherry trees are doing, and how much fruit they think they’ll have. This year, P. and I even decided to plant a cherry tree in our back garden. We want Lulu to grow up with cherry trees around her. 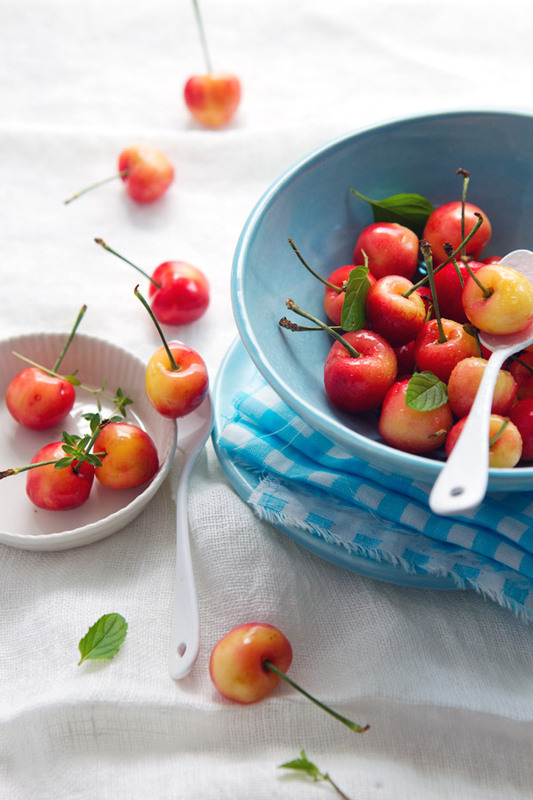 AND SO when we are not eating cherries as a snack–at this time of year, there’s always a bowl of cherries sitting on the table, and yes, I am one of these people that cannot stop once I start–I like to can them, prepare salads, make soup, or bake with them in clafoutis–and tarts. Wouldn’t you fall for their beauty too? 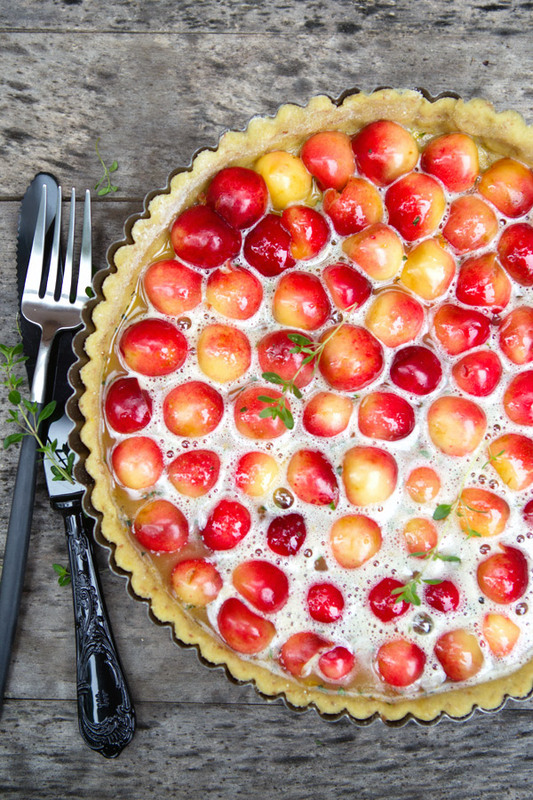 Of course, the tart welcomes any type of cherries, even if my preference will invariably go for the cheerful colors and flavor a Rainier brings to a dessert. And then, I chose a light egg-based topping allowing the flavor of the cherries to stand out. 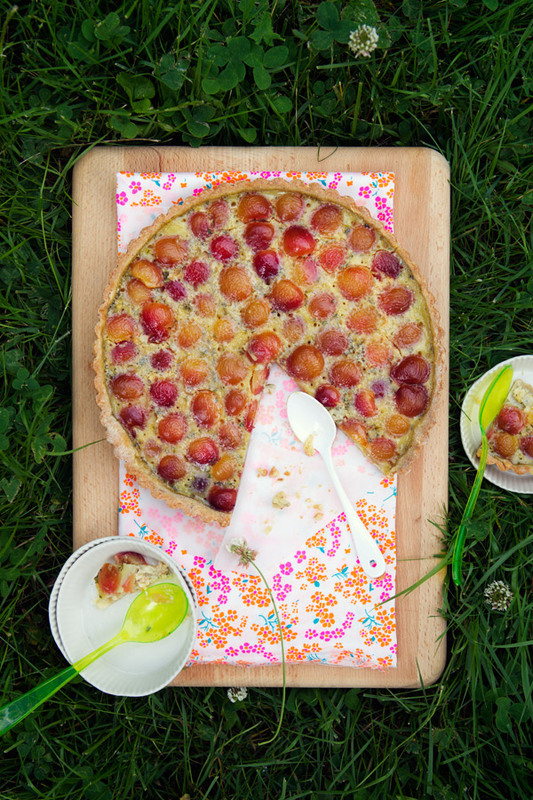 “Maman, ca c’est ma tarte pour après l’école,” (Mummy, this one is my tart for after school) Lulu exclaimed one morning after catching sight of a batch of cherry tartlets I had prepared for an afternoon goûter with friends and children. “Mais oui, si tu veux,” (Of course, if you want) I said, with a smile. I was looking forward to watching her. I knew that she was particularly excited about nibbling on the crust of her own tart. That enough made it oh so memorable and a happy moment shared together. 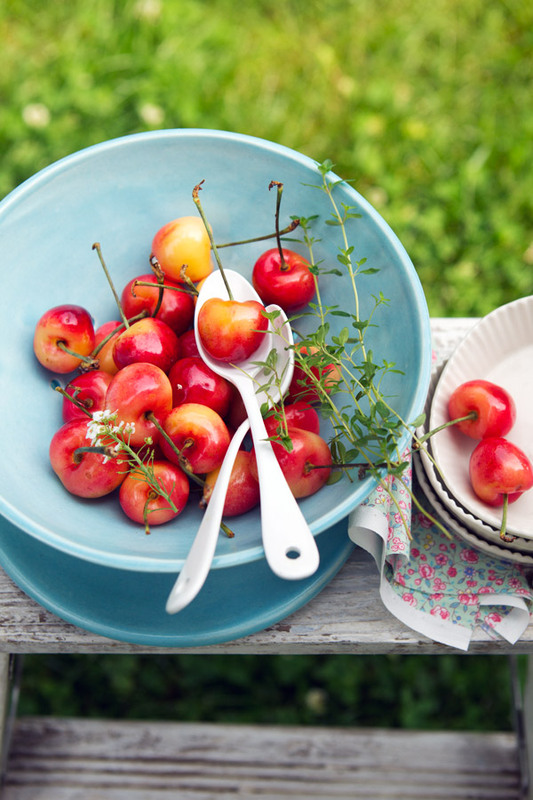 Ah, le temps des cerises, how special you are in our family! Prepare the crust as per instructions. Roll and garnish the mold. Make small holes with a fork and refrigerate for 15 minutes. Cover the crust with a piece of parchment paper and add dry rice or beans. Cook for 10 minutes and then remove the parchment paper and beans. Cook for 5 more minutes. In a bowl, beat 2 eggs with the sugar, lime zest, and lemon thyme. Pour this batter over the tart and bake for 30 to 35 minutes, or until the crust is cooked and the flan is set. Remove from the oven and let cool on a cooling rack. *Vous aurez des restes de pâte que vous pouvez utiliser avec des tartelettes par exemple. Pour 2 tartelettes, ajoutez 1 oeuf et 2 càs de sucre à l’appareil. Préparez la pâte en suivant les instructions. Garnissez-en votre moule et piquez le fond avec une fourchette. Mettez au frigo pendant 15 minutes. Faites cuire la pâte à blanc pendant 10 minutes (recouverte de papier sulfurisé avec un poids), puis 5 autres minutes sans le papier et le poids. Mettez les cerises sur la pâte. Dans une bol, battez les oeufs avec le sucre, le zeste de citron vert, et le thym citron. Versez cet appareil sur les cerises et enfournez pendant 30 à 35 minutes, ou jusqu’à ce que la croûte soit dorée et le flan pris. Sortez du four et laissez refroidir avant de déguster. I just picked a large bowl of cherries from trees in the neighborhood. Maybe this would be something to make with them! The tart looks just wonderful! Looks so good! I LOVE cherry tarts. This is so beautiful! I can imagine how delicious your tart is! How I wish cherries are not so expensive and elusive in the tropics. When I can afford it (major splurge! ), I count every fruit and every bite I take ^^ There’s never enough to bake, can or anything! I am so envious! Enjoy ^^ love your blog! This is stunning (as always). Lovely recipe! Mmmmm ravishing cherry tarts! 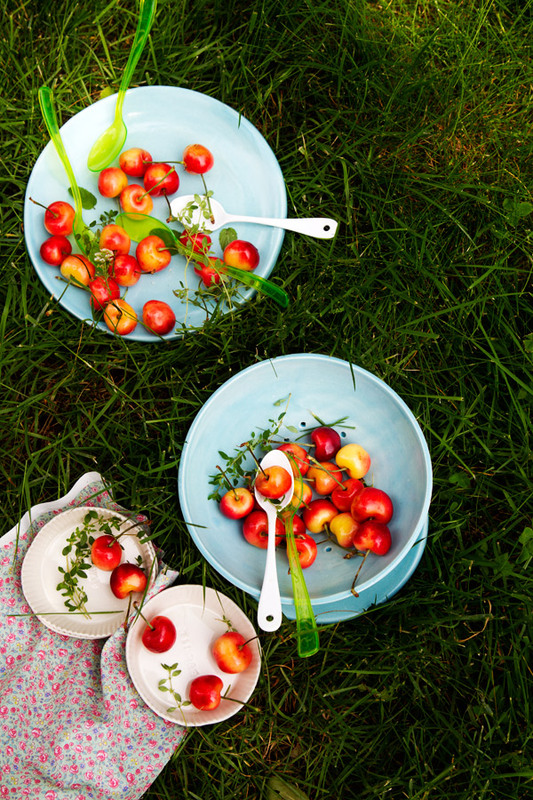 They make me dream of going to our lake cottage in northern Michigan where the cherries are abundant! Oh, I see that comment above. We used to life in beautiful Michigan. We had a cherry tree in our backyard. 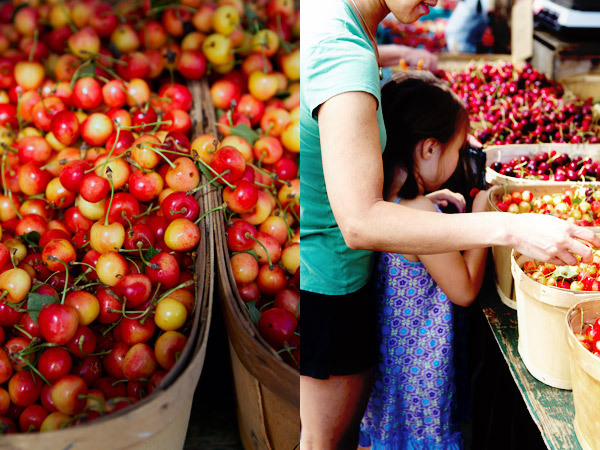 Cherries grow abundant in Michigan and so many regions have cherry festivals during the summer. I miss those!! And I was just looking for a recipe to use my never before used mini tart molds! 🙂 These look perfect! gorgeous. I’m sorry I missed your workshop in NYC. I hope you do one here again soon! Comme toujours, bon article et belles photos mais je dois dire qu’en France, nous avons aussi des cerises comme les cerises Rainier. Je suis native de Lorraine, pas loin de Metz, Nancy, Verdun…..et nous avons aussi les gros bigarreaux qui sont egalement bons et ressemblent beaucoup aux Rainiers. Bien envie d’essayer même si les cerises Rainier coûtent un bras ici! 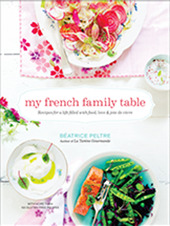 Love the recipe and the pictures! This is most perculiar.. I have not been able to view your pictures for quite some time now (since your post on Ireland). I have no problem viewing other blogs (eg. Aran’s blog, Bake or Break, Daily Delicious etc etc). I have no idea why! and have been missing out on all your beautiful pics! I’m not sure whether other readers have the same problem as me. They are cut in halves. Face down on the tart. What a perfect post… lovely recollections, darling moments & flavors savored… Thank you Bea! I have one in the oven right now! Yes, I would fall for their beauty too! Already the first picture makes me want to bite into them. Unfortunately I have a cherry allergy and I need to keep away from them for two years in the hope that it will pass. Meanwhile I enjoy cherries in cake, ice, jams…everything that is cooked. Just found Rainier cherries for the tart!! So happy 🙂 I’ll be trying them for the first time! I’m not finding lemon thyme though… can I substitute it for anything else? Thank you very much everyone! 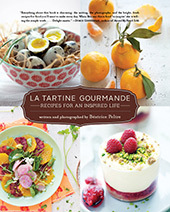 I hope that those of you who tried the tart loved it. Leticia, lemon balm would do. Or even maybe lemongrass for extract lemon flavor….I hope you like it. What does adding dry rice or beans do to the tart? May I kindly ask if you could be more specific? Do I throw away the beans or rice afterwards? Hi Nadia, this process is called precooking the crust. Use dry beans or rice that you will not use for cooking afterwards. I keep a jar in my pantry with these beans/rice and I reuse it each time for the same process. Makes sense? Moi aussi, j’ai toujours ete du cote du trottoir. J’aime particulierement quand il est legerement peu cuit; un peu comme le pain. J’adorais (et encore maintenant) manger la mie de pain que mon pere laissait de cote car il preferait la croute. Its summer and its time to enjoy that delicious pitted fruit. The colors are so bright! Its yummy for the eyes too!